We have a large number of committees, church programs and other groups that work toward our vision of being Rooted in Love and Reaching for Justice. No matter who you are or where your interests lie, we probably have something here that will beckon you to join or at least to take a closer look. 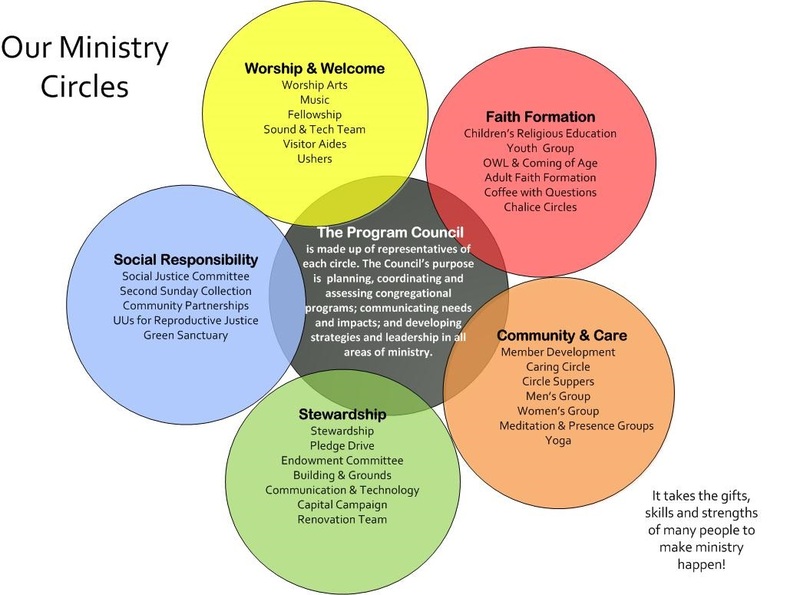 For instance, you could volunteer your time to serve on our Religious Education Committee which develops the curriculum for our youth programs, or the Worship Arts Committee, where committee members help design our worship services. Perhaps you might wish to join our amazing adult choir or give some time to our community partners which work toward justice in different, but critical, ways. Our committees and programs are organized into circles and guided and coordinated by our Program Council. Please feel free to explore the opportunities for involvement and service and find the way you want to participate!